Spring training is for trying your absolute hardest—up to but not inclusive of any effort that might land you on the DL for Opening Day. Blue Jays catcher Russell Martin very nearly tried too hard today. In the second inning of a meaningless game against the Phillies, Martin tore off his mask before he made an impressive back-handed catch of a foul popup. 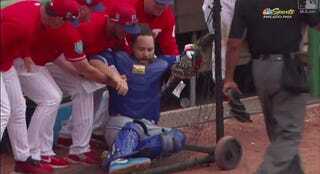 In the process, he got tangled up in the netting portion of a screen protecting the Phillies’ coaches, so when he tried to walk away, he not only tripped but also pulled the whole structure down upon himself, getting smacked in the face by the support beam. Martin laughed it off and stayed in the game, so instead of being concerned about any injury we can instead talk about how he’s fitting a sizable topknot man bun under a batting helmet. Martín Pérez Killed And Ate The Bull That Injured Him: "Good Meat"